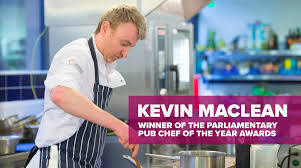 We are delighted to let you know that our Head Chef Kevin has won Parliamentary Pub chef of the Year 2018. There were over 130 chefs put forward to the competition-all nominated by their local MPs,with Kevin among the final four competing in a cook off at parliament last week.The chefs were given 1 hour to select ingredients and cook a main course for the judges,with marks being awarded for technical skill,presentation and of course taste. Kevin cooked a dish in keeping with our ‘pub’ ethos. We are proud to be very much a pub,a place where you can pop in for a pint or a snack but also have a full blown meal without blowing the budget and without compromising on quality.At the Rat we strive to provide top notch local ingredients prepared with love and served with warm hospitality.We are led by what is available on our doorstep from local farmers and gamekeepers etc so we are accustomed to adapting and creating a menu which changes often,sometimes daily. This award helps to bring Northumberland in general as a top food tourism destination to a wider audience, there are many great pubs and restaurants in the region serving fantastic food.